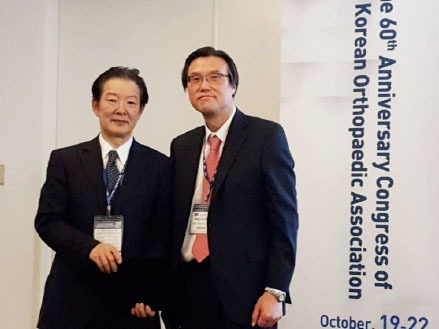 Dr. Kenji TAKAGISHI, MD, Honorary Director of St-Pierre Hospital and　Professor Emeritus of Gunma University, Japan spoke at the 60th Anniversary Congress of the Korean Orthopaedic Association at Songdo Convensia, Incheon on October 19, 2016 on prevention of elbow and shoulder injuries of junior baseball players. He introduced the results of extensive joint survey by Bone and Joint Decade Japan, the Japanese Orthopaedic Association and Baseball Federation of Japan in 2014 on 538 coaches and 10,228 players of under 12 years old from 539 teams. •	The number of full-power pitches for schoolchildren shall be 50 or less per day, and 200 or less per week including the games. •	Players should therefore take at least 2 days of rest per week. •	The coaches need to reduce the burden on pitchers and catchers and to train as many players as possible. •	Training sessions for coaches and parents by orthopaedic surgeons and physical therapists are needed to educate coaches and parents. Please click here on full details of Dr. TAKAGISHI’s presentation.